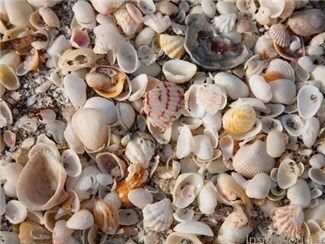 Sanibel Island is known around the world for its premier shelling beaches. The island’s geography, unique in that it lies east and west, different than most islands which lie north and south and Gulf tidal currents result in great quantities of shells washing up on the fine white sand. What fun to go shelling along the surf and beaches of Sanibel Island and catch abundant sea shells that the Gulf of Mexico brings to its shores. Riding a bike or walking/running gives you access to Sanibel beaches that are difficult or impossible to reach by car. Parking around some access points is limited to cars with special permit tags — indicated by “restricted car parking” in the list below — but cyclists can find bike racks at all of these access points. Even at the general public beach parking lots, cars will pay a $2 hourly rate while cyclists park their bikes for free.